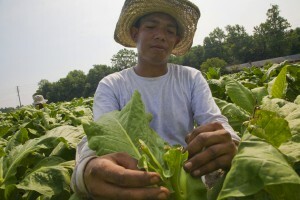 Big tobacco companies are among the richest parties in American agriculture. They have constructed a supply system that benefits themselves, at the expense of those who produce their leaf products. This includes both farmers and farmworkers. There are only a few large companies that purchase NC tobacco and they use their power to set the terms and prices for the farmers who grow their tobacco. These terms and prices directly affect the earnings and working conditions of field workers. With their wealth and industry power, companies like RJ Reynolds could be part of the solution, but have instead attempted to hold themselves out to the public as passive purchasers of tobacco. RJ Reynolds is one of the largest tobacco corporations in the world, with annual profits of over $2 billion. Reynolds executives, who can receive up to $60 million a year in bonuses, claim to be committed to corporate social responsibility, but their list of “stakeholders” excludes the farmworkers at the bottom of their supply chain. FLOC has continuously called on Reynolds American to meet with representatives of the farmworkers their company relies on for its raw product, and sign an agreement with FLOC to guarantee the right to freedom of association to all farmworkers in their supply chain. In 2012, after nearly six years of pressure from farmworkers and their allies, Reynolds finally agreed to meet face to face with FLOC. This meeting was an important first step, but our campaign will continue until there is a written agreement guaranteeing farmworkers’ right to freedom of association. In April 2018, we escalated the fight by launching a national boycott of Reynolds’s e-cigarette brand VUSE.